Posted on March 3, 2015 by Michele D.
Purim is by far one of my most favorite holidays, mainly because I love coming up with ideas for gift bags, assembling all of the goodies and delivering them to family and friends. And I won’t lie, I also love receiving Mishloach Manot as well. The doorbell rings numerous times throughout the day. And even if we are not home because we are out delivering our on baskets, we return to find stacks of goodies on our porch. So fun! Fortunately, my 8 year old daughter loves Purim as much as I do, and she is very creative. I can always count on her to come up with the best ideas for our Mishloach Manot. And my hubbie is the official note card maker. This year, Zoe wanted an ocean, under the sea theme so she could incorporate her favorite sea animals. A quick Google search turned up a similar idea from Kosher on a Budget so we took her idea and ran with it. Thanks so much Mara for the great idea. 1. Small bottle of water – we used Nestle Pure Life brand purchased at Walmart. 2. Shamu & Friends baked snack crackers (OU Dairy) – small bags in box of 12 purchased at Walmart. 3. Seaweed (Paskesz Apple Flavored sour sticks parve) – purchased in Kosher section at local grocery store / Tom Thumb. 4. 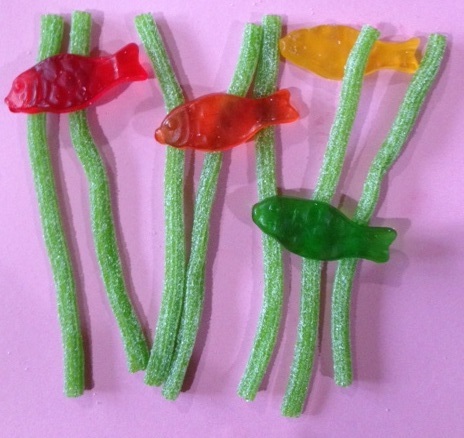 Clown Fish (Paskesz/Haribo gummy fish parve – purchased in Kosher section at local grocery store / Tom Thumb. 5. Seashell/Seahorse Chocolate / Guylian Artisanal Belgian chocolates w/ hazelnut filling (Circle K Dairy) – purchased packages of 22 pieces at Walmart and wrapped 3 pieces each in Wilton tiny clear bags from Joanne’s Craft store / tied with white ribbon. 6. Grass – various shades of blue and green purchased in Easter section at Target and Dollar Store. 7. Thick 8 1/2 x 11 paper to for note cards – Have a Splash-tastic Purim with fishbowl design. 8. Finally, we included a small note with information on Kosher symbols, etc. for the items we placed in individual bags. Gallon size freezer Zip lock bags to hold everything. Light green colored, heavy stock 8 1/2 x 11 paper, cut to fit in Zip Lock bag for note card. Have a Splashtastic Purim and fish bowl design printed on paper. 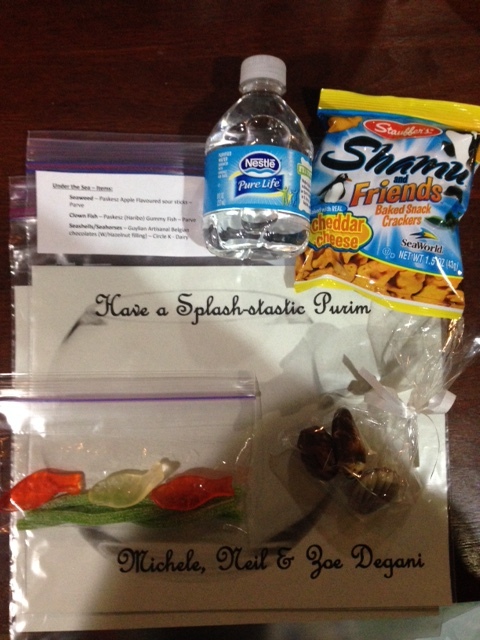 Placed 3 sour sticks and 3 gummy fish in snack size Zip Lock bag, sealed and stapled to note card, just below the “Have a Splashtastic Purim note. I stapled through both the paper and the back of the Gallon Zip lock to ensure note card and fish stayed close to top of bag. Added the decorative grass to bottom of bag. 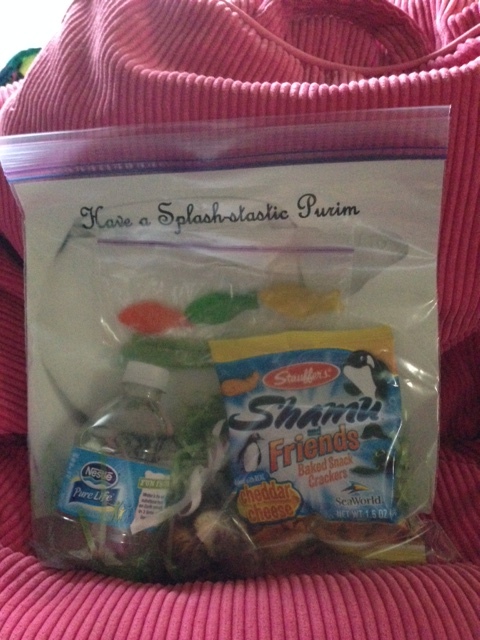 Added water bottle, Shamu Friends snack bag, Chocolates (3 to a bag). For my daughter’s friends, we added a small, plastic sea animal, purchased at JoAnn Craft Store, to each gift bag. With the exception of the stapling, this is a Mishloach Manot project that is easy for kids to assemble and requires no cooking! Happy Purim and Happy Kosher Treif Cooking.